The wreckage of the Uzuri bus that was involved in an accident at Keyo in Amuru district. Photo by David Okema. 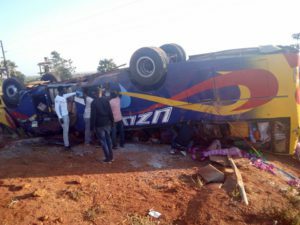 AMURU: A South Sudan bound bus this morning got involved in a fatal accident along Gulu-Juba road, leaving one person dead and several injured. The bus UAJ 880R Isuzu belonging to Uzuri Bus Company knocked Michael Okello Orom who was riding motorcycle, Reg. No. UEC 658A, killing him instantly. It later overturned leaving eight others injured. The 5:30am Tuesday accident took place at Keyo Trading Centre in Lamogi sub-county, Amuru district, about 15km from Gulu town. The bus was traveling from Kampala to Juba. Jimmy Patrick Okema, the Police spokesperson for Aswa river region, confirmed the accident and said one passenger identified as Faith Aisha was critically injured and admitted at St. Mary’s Hospital Lacor for treatment. Okema said police are investigating the cause of the accident and that a file has been opened under file number TAR 54/2017 at Gulu central police station. He noted that the bus driver, Robert Kizito, reported himself to Police at Gulu Central Police Station and that he is being kept under custody as investigations continue. Recently, Michael Omona, 54, a resident of Wipolo in Anaka sub-county was knocked dead at Kati Kati Lamogi sub-county and another resident of Atiak in Amuru district was also killed in an accident along Gulu-Juba highway.